I dunno how many times i have repeated these sentence but cant ignore it am gonna repeat again today, coz i missed many food events in this blogsphere coz of my stay in India for three months. An another event i missed during my vacation is Indian Cooking Challenge,a monthly event where we cook dishes from various regions of India.For this month's challenge, Srivalli gave us an incredible instant pickle from Maharashtra. 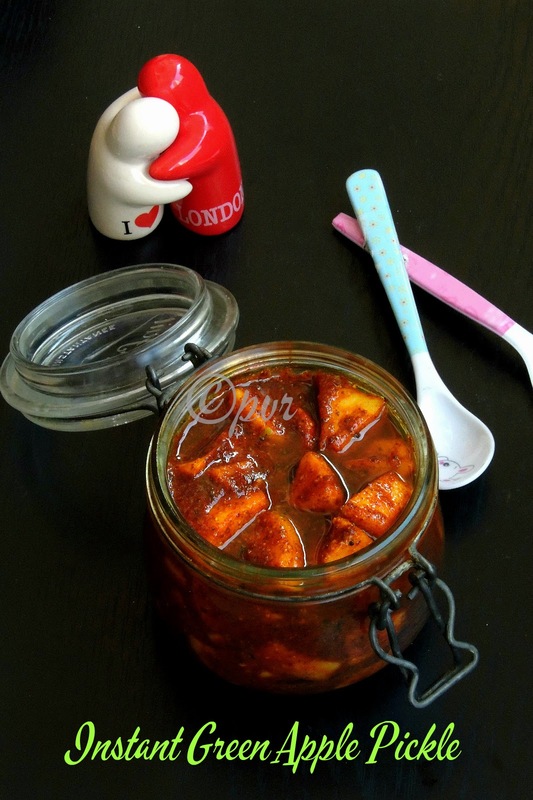 Trust me,this sweet,spicy and sour pickle tastes fantabulous, usually green raw mangoes are used for making this fingerlicking pickle, but since its not the season for mangoes here i tried this pickle with green granny smith. This recipe was shared by Varada's Mom,this pickle gets ready very easily with simple ingredients. Once i get the raw mangoes, am sure i'll try this pickle again. Varada told to dice or grate the mangoes, since i used green apple i diced them instead of grating for making this fantastic pickle. Within three days, me and my H finished half of the bottle i prepared, yes we loved this pickle very much. You can have it with anything, somehow i enjoyed this pickle thoroughly with sambhar rice. Heat the oil for tempering in a pan, add the mustard seeds, once its starts splutters add the asafoetida powder and turmeric powder and put off the heat. Meanwhile grind the mustard seeds,fenugreek seeds,turmeric powder, red chilly powder with half a cup of water as fine paste, add in the jaggery and salt, blend it well. Now add the grounded masala to the diced apple, pour the cooled tempered oil mixture over the top. Give a stir and conserve in air tightened bottle. The pickle is ready to eat. I feel like tasting this now....looks sooper tempting.. So good to have you back Priya, and your pickle pic looks amazing!..yes I loved it with raw mango, do try it when you get it..
Love that you used granny smith apple. Pickle looks yumm! Tangy and tasty looking pickle. Wonderfully prepared. I'm going to try this for sure. Bookmarking it right away. Just a small clarification. Are you sure about 1/2 cup of mustard seeds for 1/4kg of the apples? Kindly confirm. wonderful pickle! nice color. sure it would have tasted yumm..
NICE AND EYE CATCHING PICKLE I LOVE IT. Nice recipe.. will definitely make it ..
Nice idea of using green apple in pickle,like it. Sushma, yea this pickle calls for half a cup of mustard seeds, its gives a wonderful texture, in case if u want to go for less mustard seeds, just deduce according to u.
Yummy apple pickle. So creative pickle. Drools. Looks so good Priya! I made this with grated mango.Really yum,rite! Slurrp! That pickle looks mouth watering & what an idea to make these apple to pickle. I will make this soon. Hope you had a great time in India? Never tried pickle with apple...this looks so yum, Priya! Oh i am already ready for pickles as the sun is coming high .Def taste super yumm with lovely curd rice ..
Pickle looks yummy. With apple it sounds interesting!! super yummy pickle...looks really mouthwatering..
Yummy! I have a version on my blog too. We love this at home.